Valerie was educated at Cardiff High School for Girls and then went on to gain a BA (Hons) in English and American Literature at the University of Kent, Canterbury. Following a year spent in Nigeria, teaching with Voluntary Services Overseas and a year on kibbutz in Israel, Valerie worked as a Social Work Assistant in University Hospital of Wales until she could enrol for a Post-Graduate Certificate in Education, which she duly achieved with a double distinction. Valerie taught in secondary schools in Newport and in Surrey before taking a few years out to bring up her two daughters. Valerie moved back to Cardiff, where she set up and ran a pre-school playgroup for the next 10 years. At the same time, Valerie worked as a tutor of Basic Skills for the Friary Basic Skills Centre in the Friary, Cardiff. This was followed by eight years setting up and teaching Basic Skills and other subjects in HMP Parc in Bridgend before she moved from that post to set up and co-ordinate the Education & Training Department of what was then Gwent Probation Service. Along the way, Valerie gained qualification to Level 5 in the teaching of Basic Skills to Adults. 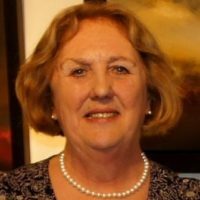 Valerie was a founder member of the Insole Court Action Group, later the Friends of Insole Court, and she has been actively involved with Insole Court for almost 30 years, the last 10+ years of which have been as Secretary or Chair of the Friends (her current position). In other spheres of life, Valerie was a member of the Cardiff VSO support group, participating in local selection panels for prospective volunteers, as well as involving herself in fundraising and awareness raising events. After the birth of her second daughter, Valerie spent a number of years as an active member of The National Childbirth Trust, taking the office first of Secretary and then of Chair. She was particularly interested and involved in the education element of NCT’s activities. Valerie’s love of cooking led to a series of Twelfth Night Feasts, organised by the Friends of Insole Court, where she catered for up to 70 people at a time. She also produced Spooky Food for the annual Hallowe’en children’s event in Insole Court. She is renowned for serving a pretty fine mulled wine for Christmas-related evenings in the Court! Valerie brings a general portfolio of skills to the Trust, including the experience gained through the years of her involvement in Insole Court and, as has been true for the past 30 years, she will turn her hand willingly to whatever needs doing.